Mr. Twine, of Liskeard, landed four fish for 8lb on buzzers. Mr. Jawoski, of Launceston, landed a good three fish bag for 7lb on a Damsel Nymph and then went on to release sixteen rainbow trout on Teal Lake. On the settled days sport has been good with fish being caught on flies fished just below the surface. John Twine, of Liskeard, landed a good six fish bag for 15lb 1oz fishing an Orange and white lure. Reuben Girling, of Mount Hawke, landed a good five fish bag for 12lb 6oz fishing a Cat's Whisker. 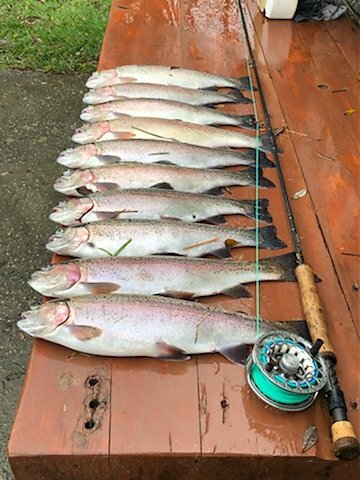 Roger Prout, of Pensilva, landed four rainbows for 9lb 7oz fishing a Cat's Whisker and a Damsel Nymph. 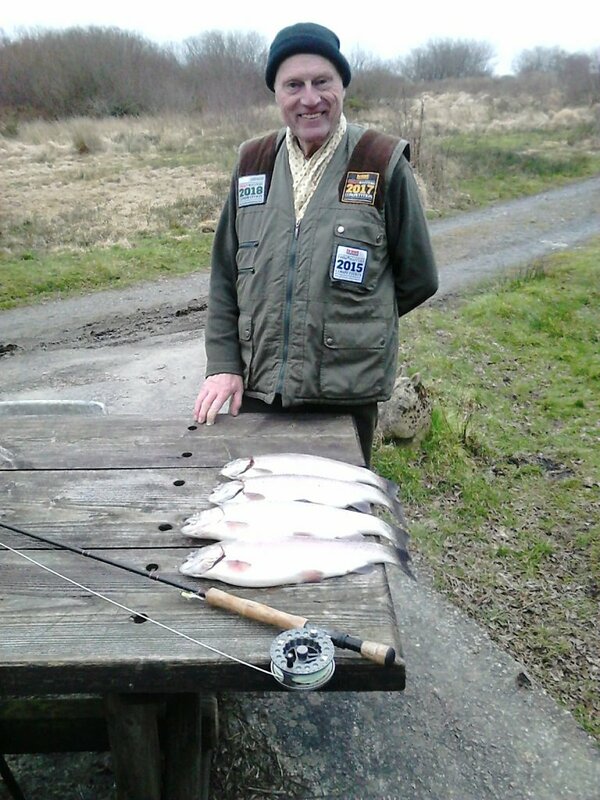 Mr Reuben Girling, of Mount Hawke, caught four fish for 9lb 15oz taken on a Cat's Whisker lure. Reuben's largest fish was 2lb 14oz. Those anglers braving the harsh winter conditions have been rewarded. Afternoons have seen the most activity as temperatures have risen. Mrs Harris, of Penryn, landed 3 fish for 5lb 1oz fishing a Damsel Nymph. Mr Prout, of Pensilva, landed a brace for 3lb 8oz fishing a Blue Flash Damsel and a yellow tail lure. On the chilly days much of the sport has been later in the day when temperatures have risen. Mini lures and weighted nymphs fished with intermediate and sinking lines have been most effective. Mr. Tussand, of Liskeard, landed a good brace for 3lb 15oz fishing a Pink Blob. Mr. Richardson, of North Hill, landed a brace for 3lb 12oz fishing a Cat's Whisker. 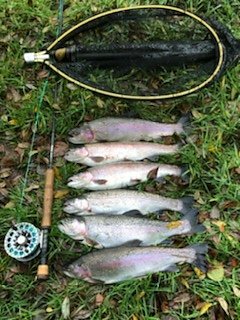 Mr. Prout, of Pensilva, landed three identical rainbows for 4lb 8oz fishing an olive nymph. Those braving the harsh weather conditions have been rewarded. Floating and intermediate lines fished with mini lures and nymphs have been most productive. Roger Prout, of Liskeard, landed ten rainbows for 17lb 8oz fishing a Damsel nymph. Reuben Girling, of Redruth, landed 15 rainbows for 25lb 11oz fishing a Cat's Whisker. Cooler conditions in October and now into November has seen improved sport. On some of the warmer days fish have been surface feeding and can be caught on floating lines fished with dry flies, buzzers and small nymphs. In less favourable conditions sinking lines with mini lures, weighted nymphs and boobies have been most productive. R Prout, of Liskeard, landed four rainbows for 7lb fishing a black Hopper, Damsel nymph and orange Tadpole. S. Munnery, of Liskeard, landed a brown trout of 2lb 11oz on a cat's Whisker Booby. A successful mornings fishing by Roger Prout of Pensilva. Fishing conditions have improved with the drop in temperature. However, on the warmer overcast days plenty of trout have been surface feeding and can be caught fishing dries such as hoppers, daddies and sedge. S. Munnery, of Liskeard, landed nine stockies in three visits fishing boobies.